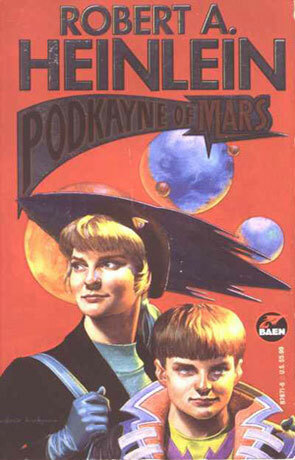 Podkayne of Mars is a science fiction novel by the legendary author Robert A Heinlein. One of the good old stories from the golden age of SF. One that I for some strange reason hadn't read before. I've always had strange feelings about Heinlein - I love most of his stories, but almost all of them leave me with a strange taste in my mouth, maybe it's because I agree with a lot of the opinions that are to be found in his stories, but at the same time I hate some of them (his ideas about women and children for example). Podkayne of Mars is a juvenile or "young adult" story about a 16 year old mars girl (she's not a martian - there's a race of native martians that's called martians - therefore humans on mars is not called martians). "Poddy" gets to travel the solar system with her smaller brother Clarke and her old uncle Tom - they get into all kinds of trouble and adventure. As can be expected from Heinlein the book is very well written and it's very hard not to get to love Paddy even if she is very naive and goody-goody. This new version of the book is a bit special - when Heinlein wrote the story in the early sixties his editor found the ending to hard and he (Heinlein) was forced to rewrite it. When Baen (the publisher of this edition) decided to reprint the book they held a ballot and asked the Heinlein fans which ending they wanted the book to have - the original Heinlein ending or the one forced on him by the editor. This book contains both endings and a lot of essays and letters about what people thought about the two endings. I found the two endings and the essays a real bonus - personally I really can't decide which ending I like the most, but I leaning towards the original Heinlein ending (I think that I agree with the essay by G. David Nordley). (Look for the Reprint edition). Written on 1st August 1999 by TC.